1.130 modular chiller The master module can work independently or together with up to 7 slave modules, capacity from 130 to 1040kW. 2. 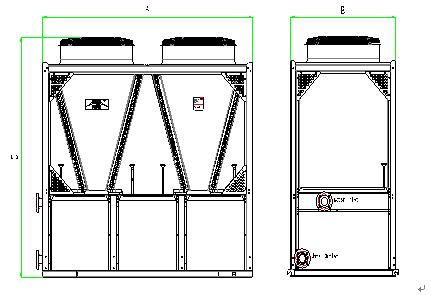 Air cooled modular chiller units with W type heat exchanger: panels, frame and base are made from galvanized steel protected with polyester powder painting to ensure total resistance to atmospheric agents. 3. Modular scroll chiller 3-phase scroll type compressor, with built-in thermal overload cut-out and crankcase heater, mounted on rubber vibration dampers. 4. External rotor type axial fans, equipped with three phase direct drive motors, low noise 8 poles, protection level IP54, provided with a protective outlet grille. 5. Evaporator built with high efficiency tube in tube type heat exchanger, factory insulated with flexible close cell material. 6. Condenser built with seamless internal screw thread copper tubes mechanically expanded into blue wave hydrophilic aluminum fins. 7. R22 scroll modular chiller Refrigerant circuit complete with charge valves, filter drier, sight glass, gas-liquid separator, thermostatic expansion valve, high & low pressure switch. The heat pump unit is completed also with 4-way valve, liquid receiver and one way valve. 8. Hydraulic circuit built with galvanized pipe, complete with water discharge connection for tube in tube heat exchanger and flange type hydraulic connectors in two directions easy for connections from both sides of the units. 10.Automatic operation dramatically reducing maintenance cost thanks to reliable microprocessor system. *** In the nominal water flow condition the pressure drop is between this range. **** Sound pressure measured at a distance of1mand a height of1.5 mabove the ground in a dear field (fan side).